AkzoNobel Industrial Chemicals (ANIC), Nedstack Fuel Cell Technology (NFCT), MTSA Technopower (MTSA), Johnson Matthey Fuel Cells Limited (JMFC) and Politecnico di Milano (Polmi) have completed the preparation and the delivery of the world’s first 2MW PEM fuel cell power plant. 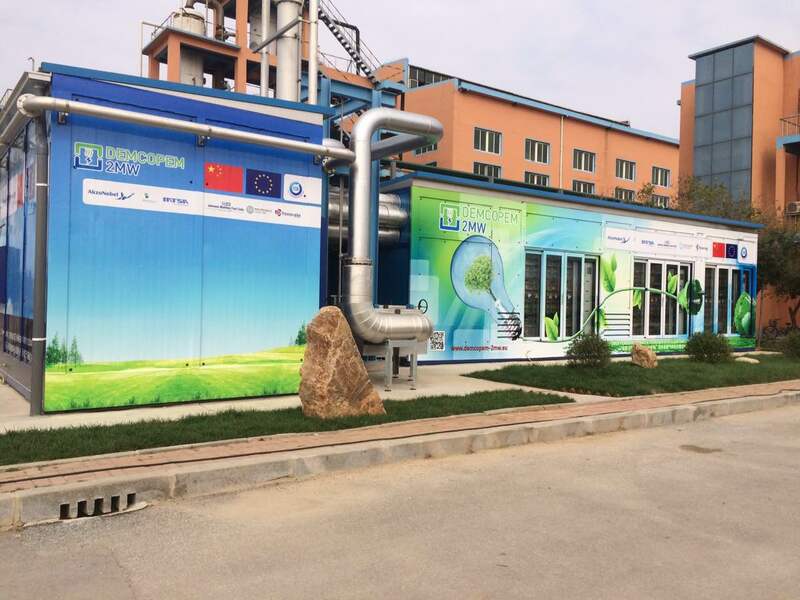 This power plant is now installed on site at Ynnovate Sanzheng (Yingkou) Fine Chemicals Co. Ltd (the end user of the 2MW fuel cell power plant) in Yingkou, Liaoning Province, China, and will be used to add value to the waste hydrogen and generate 2MW of clean electricity. This new power plant generates approximately 20% of the power requirement for all the customer’s production processes and, with no greenhouse gasses emitted in the process, provides a substantial contribution to a greener environment. The acronym DEMCOPEM-2MW is derived from DEMonstration, COmbined heat and power (or Cogeneration), PEM fuel cells and 2 Mega Watt electrical power (MWe). The work completed so far has involved the development of a process simulation model for the system (Polimi) , production of stacks (MEAs from JMFC and Stacks from NFCT), the design and manufacturing of the 2MW PEM power plant by MTSA, factory acceptance testing by MTSA and Nedstack and shipment to China during the summer. The power plant was reassembled at Ynnovate by MTSA and site acceptance testing was completed by MTSA and Nedstack. AkzoNobel, together with the coordination of the project is also responsible for the main exploitation plan (in Europe and China). 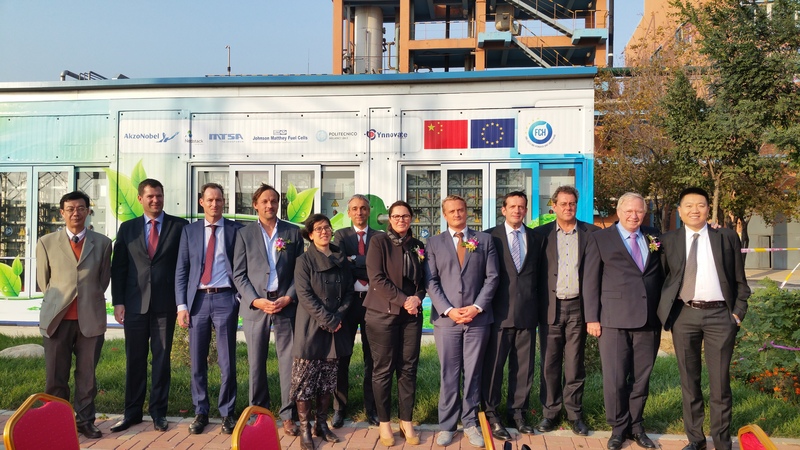 The launching ceremony for the PEM power plant took place on 13th and 14th October 2016 in Yingkou, witnessed by representatives from the Europe’s Fuel Cells and Hydrogen Joint Undertaking (FCH JU), the Dutch Embassy, Chinese industries and a large delegation of specialists from the hydrogen and fuel cell industry, including project partners, Ynnovate (owner of the new chlor-alkali plant), and other prospective Chinese customers.